You are here: Home / Sports / Was it real, or a conspiracy the whole time? Was it real, or a conspiracy the whole time? I made the prediction a couple of months ago that Brett Favre would stay retired in the end, and not play for the Minnesota Vikings. But I’ll admit, that was just a guess on my part and the more Favre waffled, I waffled right along with him. The waffling is what has Packers fans upset with the future Hall of Fame quarterback. He waffled the Packers into going another direction. Then he waffled the Vikings for months, only to stay retired in the end. The latest has Favre telling Peter King from SI.com that he’s pretty sure he’s retired, but if somebody calls Nov. 1st and needs a quarterback, who knows. More waffling, but then you probably expected that. At least the Favre diehards will be able to say their favorite quarterback didn’t play for the purple and gold, unless of course Favre changes his mind. Who knows, he could fall off his tractor, bump his head and think he’s a Viking. 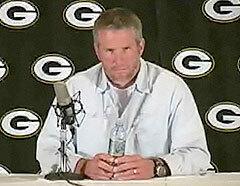 You’ll read and here several accounts of Favre’s decision in the coming week, some serious and some not so serious. A friend of mine, Phil Dawson (sports reporter) from affiliate WIBA in Madison, has this interesting, but twisted take on what this was really all about. Way to go Phil.